Ronak Engineering, an ISO 9001:2008 company, is widely acclaimed to be one of the finest manufacturers, suppliers and exporters of a diverse and superior range of Briquetting Plants & White Coal, ever since our establishment in the year 2006. This wide and commendable range inclusive of products like Briquetted White Coal, Briquetting Plants and Agriculture Machinery, is highly acclaimed and asked for in the market. The offered products are manufactured in accordance with the industry set norms and guidelines, using quality raw materials and modern machines. Because of this, the offered range’s is quality never deteriorates. In addition, the offered products are priced at the most reasonable rates possible. Equipped with modern and sophisticated machinery and equipment, the infrastructural facility at Ronak Engineering, helps us in achieving several of the firm’s goals and objectives. Its regular upgradation boosts our current market standing. It being partitioned into a number of highly operational units, helps us in the attainment of better and smoother management of the facility’s operations. These units are supervised and governed by highly skilled and experienced professionals, who put in all their efforts and energy to increase the firm’s production capacity. In addition, our working in compliance with the set industry guidelines and ethics, have helped us in the attainment of a huge client base in India as well as in several African countries. Under the leadership of our highly skilled and experienced partners Mr. Sanjay Sakhiya and Mr. Vinod Tilala, we have reached heights of success. Their managerial skills, ability to make decisions and understand the market changes, have always been our greatest assets. Further, to provide maximum satisfaction to the employees, they provide regular rewards and increments. Manufacturing and Trading of Briquetting Plant and Briquetted White Coal. 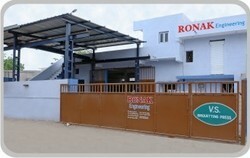 Ronak Engineering, is widely praised for its state-of-the-art infrastructure. The facility laced with all the equipment and machines, is required for attaining a number of the firm’s objectives. In order to maximize our market share, the facility is regularly upgraded. For the purpose of achieving better and smoother management of its operations, the facility has been parted into several highly operational units. These units led by skilled professionals, work in a united manner to increase the firm’s production capacity and improve the standard of quality. 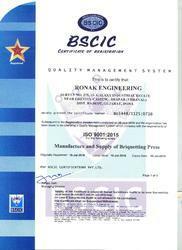 At Ronak Engineering, providing quality products is our primary concern. Thus, we engage in the utilization of high-grade raw materials and modern machines, complying with the set industry norms and guidelines for the manufacturing process. Because of this, the offered range is characterized by superior strength, impeccable functionality and longer functional life. In addition, the offered range is sent for a number of quality examinations, where with high precision, all manufacturing defects and flaws are eliminated. At Ronak Engineering, we proudly boast of our team of highly dedicated professionals, recruited on the basis of their ability and willingness to work. This team helps us in the attainment of several of the firm’s goals and objectives. For the purpose of smoother and finer management of these professionals, they have been divided into a number of groups based on the functions performed by each group. The division of the employees is done based on their skills and areas of expertise. In addition, the units work hard to maximize the firm’s productivity and standardize quality of the products. We are counted amongst the finest manufacturers, exporters and suppliers of this highly commendable range of Briquetting Plants & White Coal in the market. Manufacturing of this range done in accordance with the set industry guidelines, utilizing the finest raw materials and modern machines, standardizes its quality. Because of this, the range’s performance and functional life are widely acclaimed. 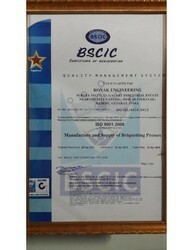 For quality standardization, the offered range, post manufacturing, is sent to our team of quality experts. These professionals with high precision, eliminate production flaws. Further, the range priced reasonably, packed in a superior manner and delivered on a timely manner, makes us one of the primary preferences.